Fast ELISA kit now available: Boster is proud to announce the newest Picokine Fast ELISA kits. Now you can perform what used to be 4+ hour ELISA assay in under 1.5 hours. 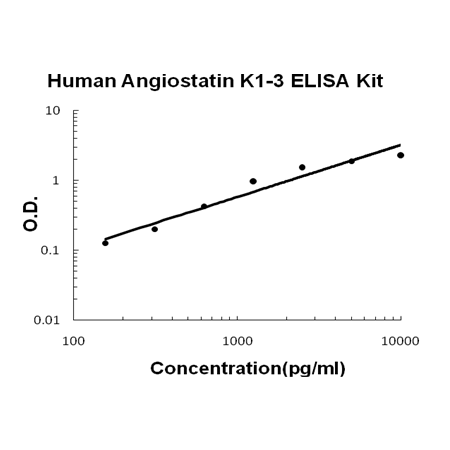 Available for Human Angiostatin K1-3 PicoKine™ Fast ELISA Kit and many others. Sandwich High Sensitivity ELISA kit for Quantitative Detection of Human Angiostatin K1-3. 96wells/kit, with removable strips. Secreted . Locates to the cell surface where it is proteolytically cleaved to produce the active plasmin. Interaction with HRG tethers it to the cell surface. Plasmin dissolves the fibrin of blood clots and acts as a proteolytic factor in a variety of other processes including embryonic development, tissue remodeling, tumor invasion, and inflammation. In ovulation, weakens the walls of the Graafian follicle. It activates the urokinase-type plasminogen activator, collagenases and several complement zymogens, such as C1 and C5. Cleavage of fibronectin and laminin leads to cell detachment and apoptosis. Also cleaves fibrin, thrombospondin and von Willebrand factor. Its role in tissue remodeling and tumor invasion may be modulated by CSPG4. Binds to cells. .
Ang K1-3 is a single, non-glycosylated polypeptide chain containing 259 amino acids. It represents a proteolytic fragment of plasminogen containing the first three kringle structures. Ang K1-3 reduces endothelial cell proliferation and acts as a potent inhibitor of angiogenesis and tumor growth. It displays increased inhibitory activity(ED₅₀ =70 nM) relative to kringles 1-4(ED₅₀ = 135 nM).